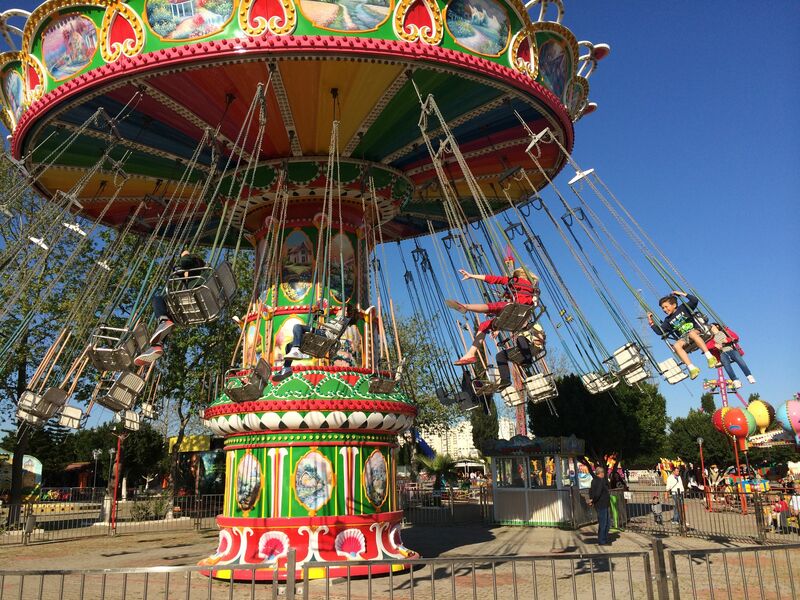 There is a big Lunapark in Antalya, right on the way from the apartment to the garden. Baki used to beg to go there every single time we passed it. Luckily, his persistence wore out, but he does pipe up on a regular basis to make sure we remember that he really really likes to go on the rides. Well, in my last post I said that March is important because it has my birthday in it, but actually there is a far more important birthday this month and that is, of course, Baki’s. I consider it a special day for myself too, because it’s the day I became a mother (I know that sounds cheesy, but there you are). We had planned to have a party for his whole class, doing something outdoorsy. But Baki really wanted to celebrate before his school holiday starts on his actual birthday, and I couldn’t imagine pulling a party together on such short notice. So as a compromise, I offered to take him and a few friends to the Lunapark. It was actually a little controversial among his classmates that he did not invite the whole class, and I felt pretty bad about putting him in that position. But it sounded like the kids really discussed it, and then I didn’t feel so bad. It can be good to throw a spanner in the works once in a while. I just hope he doesn’t get ostracized from other parties… I told him we’d do a party for everyone next year, if he wants. Well, five kids in an amusement park is an easy A. The kids had a whale of a time. One disadvantage of the Lunapark, as one of Baki’s friends’ moms pointed out, is that there are a lot of rides for really little kids, and lots of rides for teens, but not as much for kids Baki’s age. Luckily, her daughter Lexi knew the ins and outs of the place and guided us to every ride they could go on. She was absolutely fearless, and gaily threw up her hands and screamed on the rides while Baki and the boys looked green around the gills. I really loved hanging out with Baki and his friends, and seeing their boundless energy (though I wish they didn’t have to run everywhere – what’s wrong with walking??) and the great camaraderie between them. We stopped for a snack, and it was so much fun to listen in on their conversation, with all of the kids talking at the same time and somehow managing to communicate with one another. Another thing I liked was that when some of the kids were too scared to go on a ride, they just said so, and no one made a big deal out of it. I kept it short and sweet — we were there for about an hour and a half and then we went out for ice cream nearby. I think it is a good thing that we did it that way, because by the time I drove Baki back out to the garden, I was half demented with tiredness. I made dinner in a daze: fish in salt – a meal you can actually make in your sleep. I’m living proof! 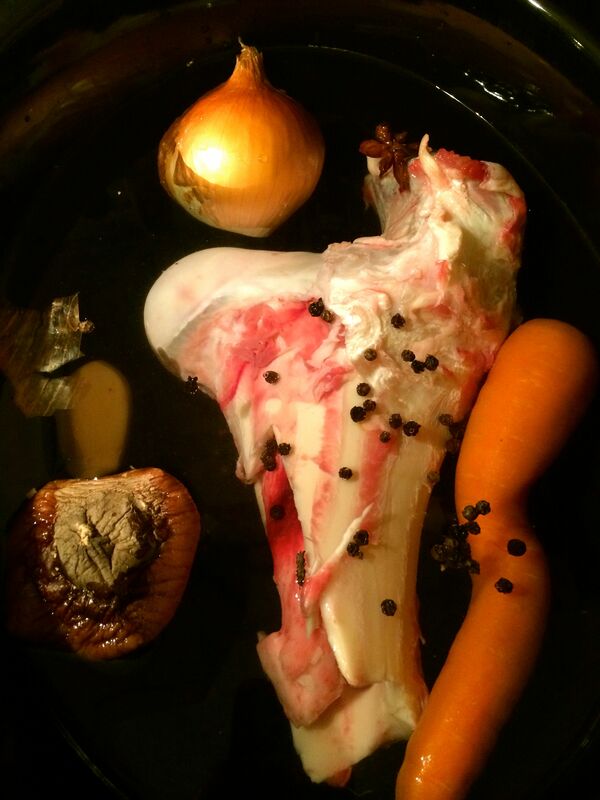 Now that that’s over with, I am making my favorite tonic — beef bone broth. We stopped at the butcher on the way back into town today and they had soup bones, so I got a huge, 5 pound beef bone. I am just using half of it. Bone broth is my new obsession; it is insanely good for you — promoting gut health (including an ability to help heal the disgusting sounding Leaky Gut), and joint health of course, plus it is good for your skin and hair and nails, and it’s got valuable amino acids in it that you don’t get from muscle meats. There is a summary of its benefits here. To make this elixir, I use a liter/quart of water for each pound of bones, and add an onion (unpeeled, which gives a lovely rich color), a carrot, a few tablespoons of vinegar (to leach the minerals out of the bones) and then anything else I have that seems like a good idea at the time – parsley stems, peppercorns, bay leaves, celery, etc. In this batch I have dried mushroom for umami, a chunk of ginger, star anise, and peppercorns. I cook it in my new best friend, the slow cooker. My slow cooker can cook for up to 20 hours, so I do it for the whole twenty on Low Heat and then when it’s finished, I run it again so it cooks for 40 hours total. But I dip into it while it is cooking. And of course, the stove is also an option, though I would feel nervous having the stove on while I slept or was out of the house. My mom and I always keep stock in the freezer, but I never realized what a healthy, healing food it was. A cup of this in the morning with some salt and pepper makes me feel ready to be shot out of a cannon! Be warned, though, it is not everybody’s cup of tea — Ali hates it on its own. Never fear though, if you have good bone broth a hearty soup or gravy is never far off, plus it adds great flavor to braises. It is this fine line that you have to walk between being a patsy and being a killjoy. I guess the thing to remember is you can’t always please everyone! How nice that March is very special for you. It sounds like Baki had a nice celebration. I think we go to far with the Invite Everyone or No One thing…by the time kids are Baki’s age, they have real friends, and those are the people they want to spend special times with. I have no doubt that there are at least a few Moms nearby who just breathed a sigh of relief – they want to do that too, but wanted someone else to be first. A very Happy Birthday to your very grown-up boy! Thank you so much! I was actually surprised that Baki was happy with the arrangement, and he wasn’t all that perturbed by his classmates’ reactions. It’s true — there are real friendships already underway at this age. Belated birthday wishes to you and to Balki! I hope you both had enjoyed your special days. I think Marie made an excellent point. Kids at Balki’s age know who their friends are. I think the “party” you gave Balki was a very good idea and totally in tune with what boys his age would like. i would have loved a party like that when I was a boy. Thanks so much. We did have a really fun day, and I feel like I know his friends a little better after spending some time with them as a group. A very noisy group! Greetings and happy belated birthdays! What’s your slow cooker like? Can i get one in İstanbul? We should have a bone broth party the next time you guys are down here! Happy Belated Birthday to Baki too!